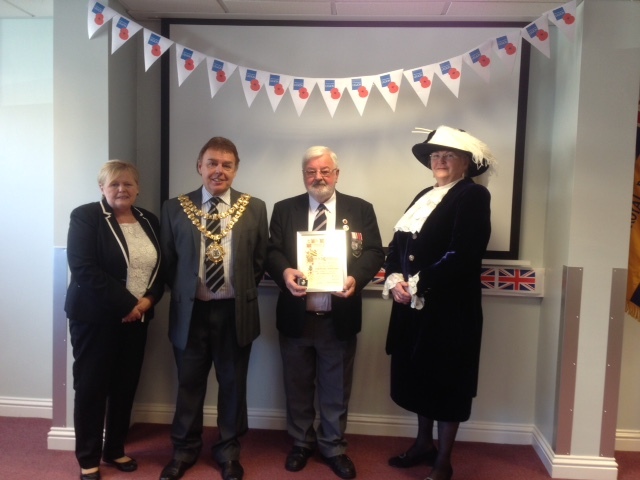 Tyldesley veteran John ‘Jack’ Shaw Robinson’s 44-year service to The Royal British Legion (RBL) has been celebrated with a civic reception, held at Compassion in Action’s Patrick House on Leigh Road. Seventy-nine-year-old Jack has been Secretary and Treasurer of his local branch for the past 18 years. He was awarded lifetime membership to the Legion and received by guests of honour including the Mayor and Mayoress of Wigan Borough, Ron and Janet Conway; the High Sheriff of Greater Manchester, Lady Smith DL; and Lord Peter Smith of Wigan Council. “It was a lovely surprise to see so many dignitaries as well as colleagues from the Royal British Legion, including Denise Edgar from our Board of Trustees who had travelled down from York, and David Brown, our Chairman from Greater Manchester,” says Jack, who signed up to the Royal Navy in 1955 and served for seven years overseas in Cyprus and Egypt – including throughout the Suez Crisis – and was on reserve for a further decade. The reception also marked the one-year anniversary of our Veterans’ Brunch, which was held for the first time on 9 October 2015. “Each Thursday, these fantastic facilities give our local veterans a place to meet up and chat,” says Keith. “Drinks and a two-course meal are provided free of charge. On behalf of all those who attend, thank you very much to Compassion in Action for all you do for us. Following his service, Mr Robinson worked for United Friendly Insurance, rising to the position of Area Manager. Now retired, he spends his time volunteering for the RBL and visiting ex-servicemen who are lonely or experiencing ill-health, providing them with much-valued companionship. “Like all veterans, Mr Robinson is a great asset to our community and an inspiration to all our Recovery Academy Members,” says Pam Gilligan, our Chief Executive. If you would like to know more about our Veterans’ Brunch, held every Thursday from 11am to 1pm, please telephone 01942 418830.